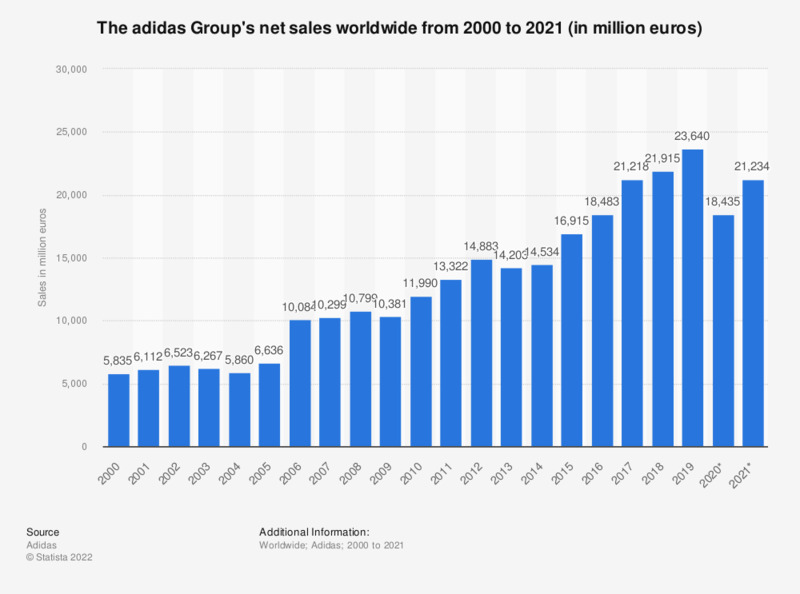 This timeline shows adidas Group's net sales worldwide from 2000 to 2018. In 2018, adidas Group's net sales amounted to about 21.92 billion euros. The adidas Group is the largest sporting goods manufacturer across Europe and the second largest worldwide – only behind long-term competitor Nike. The company manufactures sports clothing as well as other products such as bags, shirts, watches, eyewear, and other sports- and clothing-related goods. It is headquartered in Herzogenaurach, Germany, but has further major locations all over the world. Adidas was founded in 1949 and employs around 57,000 employees worldwide. The company name has originated from its founder: ‘Adi’ from Adolf and ‘Das’ from Dassler’. The sportswear company sells products under their brand names adidas, Reebok and TaylorMade. The adidas official brand logo is characterized by the three stripes and the three leaves symbolizing the Olympic spirit which combines the three continental plates. The adidas brand was rated among the most valuable German brands in 2017 and enjoys a great brand loyalty among consumers of both genders. Reebok is known as a global sports brand and TaylorMade is mainly operating in the golf business. According to the latest annual report, the net sales of the adidas Group worldwide amounted to about 21.22 billion euros in 2017. The company sales are divided in the following product categories: footwear, apparel and hardware. Footwear captured the largest sales share in 2017. Besides selling sporting goods, the Adidas Group has repeatedly sponsored a range of sport clubs involved in a large variety of different sports. However, the marketing focus of their sponsorship still focuses on the team sport of soccer.